This post has two ideas for plays to run against 2-3 zones. 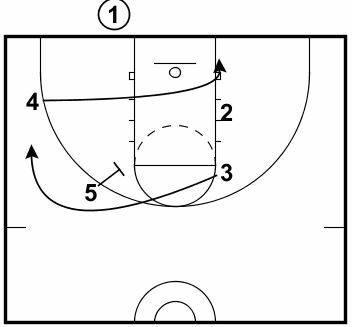 The first is a Baseline Out of Bounds play for a three point shot from Purdue. 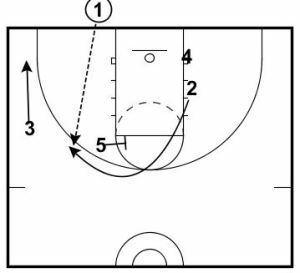 The second is a quick hit to get the basketball inside from Kansas. 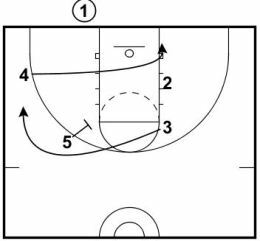 These plays are from Scott Peterman’s Zone Offense and Zone Defense notes collection. Any bundle of 4 Coaching Toolbox & HoopScoop eBooks is $35. Or. Create your own bundle by selecting any 4 of these eBooks and emailing me at [email protected] or call/text me at 765-366-9673.>. 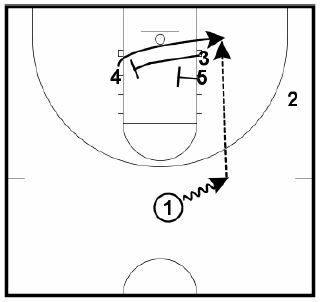 The action begins with 4 making a hard cut out of the corner to carve out space on the opposite block in front of the weak side defensive forward. If he does a good job, it draws the middle defender towards him as well. At the same time, 3 loops from the weak side elbow to the strong side wing with 5 screening in for him. In diagram 2, you see 2 follow a similar path once 3 has cleared the wing area. This is consistently an open three for the Purdue player in this position. Starting in 1-2-2 set, the action is initiated by the 2 wings running into a cross. 2 goes first with the goal being the two wings crossing each other’s body on the right side of the lane. 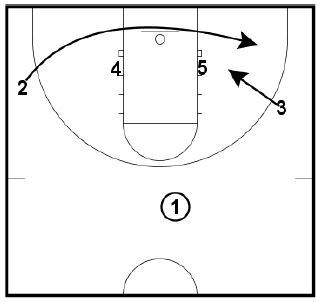 Rather than popping out to the wing, 3 steps to screen for 4. 4 gets another cross screen from 5 and cuts underneath the rim to a spot just below the block to catch a post entry pass from either 2 or 1.